Back in the 90’s, my knowledge of Horror Films extended to Universal’s famous Monsters. My Dad enjoyed the creature features and someone at work suggested we watch the new Mummy. He said it was more of a Dark Comedy than scary. So, Mom, Dad, Sparky and I got cozy on the couch and watched Universal’s newest Creature Feature. And it became an instant hit. From that night on, I was obsessed with all things Egyptian. I made myself my own Book of the Dead and Book of the Living. Luckily for me, we started to study Egypt in school around that time. I got really in to learning the alphabet and writing my name on papyrus. So, I accumulated a nice little collection of relics for myself. And I was quite heartbroken when I learned that present day Egypt is quite different from how it looked in ancient times. And when the Mummy returned 2 years later, I was pumped. In my opinion, those two films really work as a whole. I think the first one was just about perfect, Brendan Fraser was in the right spot at the right time. He’s never been so dashing before or since the first film and Rachel Weisz was adorably astute. The only part of the film that I was disappointed with was the ending fight sequence. Imhotep is about to kill Evy in order for his true love to take her body, when suddenly Rick comes to the rescue. But suddenly all Hell breaks loose. Rick has to fight the mummy guards, Imhotep wanted the Book of the Living and Evy must escape Anck Su Namun. I wanted more of a fight scene between Evy and Anck Su Namun. And if it wasn’t too much to ask, I wanted Anck Su Namun to have her human form and to have a larger role. And I guess it wasn’t too much to ask because this was exactly what we got in the sequel. 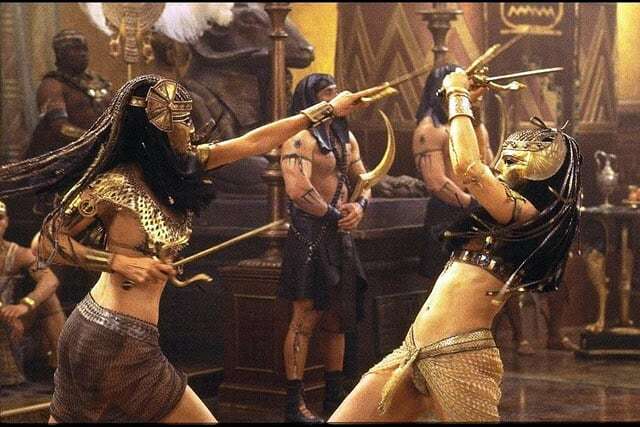 FUN FACT: Rachel Weisz and Patricia Velasquez trained for their fight scene to the point where no stunt women had to be used. The action is all them. And that’s why I would consider these two films very good companions to one another. Sometimes, it’s just really nice to see familiar faces again. This is why I refuse to watch the 3rd film, The Mummy: Tomb of the Dragon Emperor. They had to replace Rachel Weisz after she had her baby. Click here to check out the Picture that goes with this Post! Evy was intended to be the daughter of George Herbert, 5th Earl of Carnarvon who was in charge of the 1922 finding of King Tutankhamen’s Tomb. George Herbert had his daughter, Evelyn Carnarvon along with him on the expedition. The novelization of the film goes into greater detail of Evy and Jonathan’s back story. The reincarnated Anuk Su Namun wears a dress with sleeves designed to look exactly like the body paint she wears in her previous life. Remember when the evil curator sticks his hand inside the tomb while wearing the bracelet, simultaneously bringing the pyramid back to life and stripping the flesh from his hand? It’s explained in the novelization that the pygmy mummies use the pyramid as a place of worship and enjoy attacking all intruders. In the novelization he looses his whole hand. I think I prefer the bony movie version.